Joe Tolbert: For those who don’t know you or your work, can you tell us about who you are? Andre´Daughtry: I was born in Queens, New York, and a couple years after that, my parents moved to New Jersey. I grew up in the Trenton and Princeton University area, which was quite interesting because Trenton is a predominantly Black neighborhood that’s middle class to poor and Princeton is a rich and highly educated area. They‘re only about 10 to 15 minutes apart from each other. I went to Lawrence High, that is like right in between the two cities, so I could get out of high school and go to the independent movie theater at Princeton University and watch an Ingmar Bergman film or Alain Resnais, a lot of interesting stuff. I didn’t take it for granted growing up because I knew it was special. I thought everywhere else around the country was like that until I really started to travel and see that people’s areas and high schools were much more homogeneous. I came from an environment where I learned from a lot of different folk and a lot of different interests without having to travel really far. That’s been a huge influence on me because that made me interested in culture at a very young age.I really learned to be malleable with tastes because I liked a little bit of what everybody was doing, so I feel privileged from coming from that kind of environment. JT: Can you talk a little more about your artistic practice? AD: Because of the interest in culture, I gravitated toward photography. I picked up the camera as a witness and reporter in a way without even knowing it. I just knew what was happening around me was what was interesting as opposed to drawing and painting. You can depict, obviously, with drawing and painting, the world that surrounds you, but the camera is very immediate. It also has a certain level of veracity, a certain level of truth-bearing that I never felt painting and other mediums had. Having this piece that is a reflection or a copy of something you actually saw in the real world and develop that in the darkroom, I found that process to be speaking to life. I feel that as an artist, that’s what I really want to do, speak to the actual lives that are in front of the camera that people can actually see. JT: In a lot of your work you use modern and contemporary dancers. 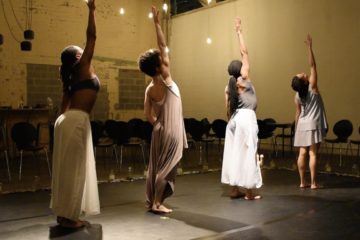 What is it about the Black body in the practice of modern and contemporary dance that suits your practice? AD: The first thing that I want to say about the Black body is that I feel like I approach my work in a way that is similar to how Octavia Butler wrote her books. She fashioned her characters from the types of people that she knew and that she grew up with, but it doesn’t necessarily mean that what it is that she was aiming to say in her books was exclusively Black. and I feel that as well. I like to work with dancers, because of my questions of the ephemeral of the esoteric aspect of mysticism, and the subjective instance that takes place to an individual that can be interpreted as a mystical happening—something that has more significance and meaning outside of just the experience of that person. Dance is a medium, as Yvonne Rainer would say, that rests in memory. The piece is staged and it takes place. Then once the dance is done, the dance is done. Of course, dealing with dance with a camera is a level of archiving, but the actual performance itself is an action that the true effect really does rest and stay in the mind and memory of the viewer. That’s how I see spirituality, faith, and mysticism. I find that the body is the capacity for language, and the body is the capacity for action. Also, the body’s relationship, when dance is used, with space, are things that have been of interest to me for a long time. Where’s the body allowed to go? Where can it enter, where it cannot enter? Dance seems to be able to speak to that without having to use words. I think that words, at the end of the day, a theater piece, or whatever, are able to construct something that has a certain durability to it. I try to stay away from those types of constructions, because when we speak of the mystical or of the divine, there is a slippery touch and go relationship that is not quantifiable at the end of the day. Movement and the investigation of movement and the research of movement goes into territories that as a visual artist, inspires me to think more about bodies and the systems that surround them as constructions from the ephemeral and ethereal, as opposed to a concrete and permanent ideology. JT: You hinted at this, but what I find interesting about you is that you’re an artist who went to seminary and those two things, for some people, don’t seem to go together by the way that people put art and religion at odds. Can you talk about your seminary, studying ritual, and how that has impacted your work? AD: I went to CalArts for my MFA, and I never went to an art school before, so I don’t have a BFA. One of the great things about going to grad school is that if you work a lot, and you keep working, you’ll notice that regardless of the idea or concept that you had in your mind that you were trying to express certain ingredients and traces of ideas keep coming back making themselves present. By the end of the two years, I realized that the religious aspect of my personality and thinking of ritual kept appearing in my work. How communities work around ritual, how communities claim to be doing something with each other but motivated by something that is unseen and that everyone agrees to the unseenness…all of those things were very interesting to me. They were always showing up in my work, but there was no one there equipped to talk out what kept showing up in my work. I’ve been a big fan of Cornel West’s work. He would always mention Union Theological Seminary, so I looked up the seminary and saw they had a theology and the arts program. On a hunch, I applied and thought about what would that kind of environment— people thinking about their work as being a calling as opposed to what I noticed in art school where it’s more preparing for a career— do for me? I have a feeling of being called, so I figured that seminary would be a good place, as long as it was loose enough in the curriculum, which it was, for me to design what it is that I was interested in which is society and religion, and aspects of liturgy. These were the conversations I was looking forward to having, and I very much did have those conversations. I find it to be very fortunate because I didn’t have to immediately cut off the two years of getting an MFA, be left with all of these traces of things that kept showing up, making themselves apparent inside my work, and then not have the next place allow me to explore how these things were working inside of me. JT: I find it interesting that you use terms like spirituality and mysticism. What is it about those words that appeal to you versus religion, and how are those words captured in art and your own artistic practice? AD: I’m not anti-use of the word religion. I think that it is a part of the secular culture that we have that religion is so bad, because of its oppressive history. Mindfulness meditation is so popular these days, but it didn’t just come out of a vacuum. It comes out of a religious tradition. Even if it is not a theistic religious tradition, it is still a religious tradition that looks inward and looks toward the subjective mystical experience of Zen Buddhists masters, one of the many traditions of Buddhism. It is an important root for people who are now trying to find some space outside of this hyperactive information society that we live in. JT: Can you talk about your new project New Sanctuary Project? AD: The New Sanctuary Project is an interdisciplinary photography, film, and dance social documentary that shows Ramesh’s (protagonist of New Sanctuary) ritual of reporting to his Immigration Customs Enforcement (ICE) check-ins. The film acts as a counter-ritual that restores Ramesh’s humanity within the scope of New Sanctuary Coalition’s accompaniment and advocacy programs.With New Sanctuary, I wanted to visualize with lens-based media some of the truths of what that collaboration is, and also try to realize some of the metaphysical elements that engender a passion for those who participate in the movement. My interest in lens-based media is because we live in a time where the lens has two major functions. We have the lens that aids us in the objective fact creation of how the world works. The telescope and the microscope were a huge aide to the scientific community for us to know reality in its material form, but at the same time, there is also the soul. There’s also metaphysical, and the lens is able to speak to that as well. There is no wonder that there are so many superhero movies out. Those are lens-based media products and they specifically speak to our understanding of tragedy and our understanding of hope, which is completely different and a non-quantifiable, but at the same time, it’s a qualitative aspect of life. It is so intriguing to me that the lens which gives us a certain objective fact is also able to bring us a truth at the same time. In her essay, The Site of Memory, Toni Morrison talks about truth as something that is ascertained by humans. So fact is something that you measure and is empirical. This happened here or this took place there or we can measure the amount of such and such material, or measure the Earth going around the Sun, and gravity, the solar system, and all of these things that religion would not be able to have access to proving. But when we talk about truth, Black folks have known that we’ve been victims of police brutality and white supremacy since we’ve been here as an enslaved group of people. We didn’t have to have the lens of a camera or a cell phone, even television coverage to let us know the truth of what our position is in the country. It is very important to highlight how Martin Luther King Jr. understood the power of the lens and made sure that there was camera coverage at events like Selma to bring the factual actions that were taking place against people of color in this country into the homes of white people, so that they could actually, therefore, become witnesses to the truth that black folks have been holding onto. It’s very interesting to see how the lens has a twofold action of fact and truth. And that discussion has been investigated frequently in art. Bringing a lens based practice to New Sanctuary develops this investigation in a new way, not just highlighting a person of the African Diaspora who has dealings with Immigration Customs Enforcement and immigration services here, but how the actual community is a community who follows a mystical calling, a spiritual motivation to have a voice and a presence to make ICE be accountable to all those people who show up. I went to ICE for a year with Ramesh, as a part of New Sanctuary’s accompaniment program, just as a witness, as one of the people who accompany immigrants when they check in, to hold them (ICE) accountable that Ramesh just didn’t disappear. You never know if you’re actually going to be able to come out. To be able to use the lens to work as a social documentary or social realist medium to share what’s actually happening in an individual’s life who has to deal with immigration, but then to be able to pull out some of the metaphysical, the ritual, the mystical, the subjectivities that are taking place, that are aiding in championing his fight, that’s what’s so intriguing to me about really sticking to photography and film as a way of trying to breach the gap that contemporary western culture commonly holds as the separation of sacred and profane. I feel that the lens has the ability to envelope and capture the two so-called disparate concepts because it is inherent in the lens to function already on two disparate levels as it is. JT: What truth did you uncover about immigration and its impact on people of the African Diaspora? Were there any discoveries that you found out after going with Ramesh for a year and the subsequent development of this New Sanctuary Project? AD: One of the things I learned was the fact that people of color, specifically people of African descent— because of racial profiling and police activities that none of us are naïve or ignorant about— have a higher percentage rate of contact with immigration services. That was new information, but I wasn’t surprised. It just solidified my reasons for working with a person of color. I used a black male because that is a world that I am familiar with when speaking of spirituality and immigration. But the very choice of using someone that I’m familiar with, even without me having to think of it as a black story, automatically implicates the ethnicity of the person and therefore creates pathways and a mapping, a kind of system to retrace itself back to some of the primary evils of our time, the relationship to slavery, the current conditions of black people, and the capitalist economics that created the American empire as we know it. JT: In the film, there is a heavy African aesthetic deployed, from the music to the costumes and choices of dance styles, what made you go that route? Was it because the protagonist is a person of the African Diaspora? AD: That’s definitely one of the factors with my understanding of African religiosity when it finds itself inside the black church. Anybody that’s been to a Pentecostal church and watches someone catch the holy ghost can recognize that. African American culture is a new world continuation of what came from the African continent. Those African religiosities that we brought with us from West and South Africa became creolized religions like Santeria, which take the understanding of the cosmologies of Catholicism and bend them. When we’re speaking of the Orishas, I’m always thinking about all of these presences that are there that a person in the Pentecostal church would deny as having anything to do with. 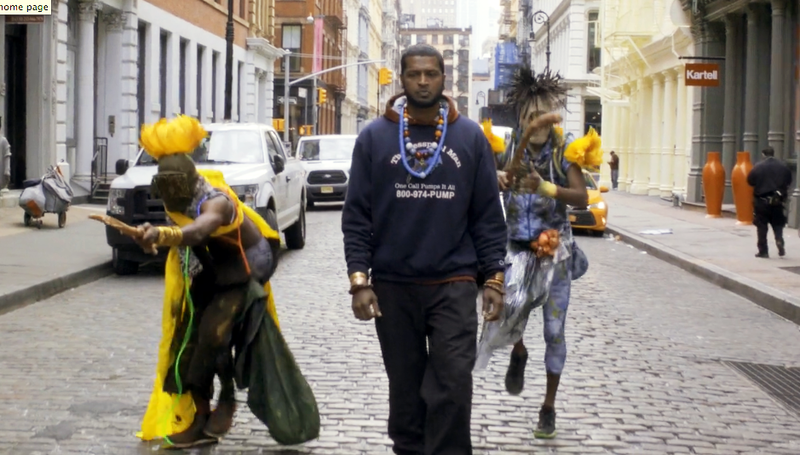 One could say catching the holy ghost visually looks very similar to someone being a medium of the spirit of an Orisha like Elegba or Shango. These interests of the body moving and doing things that are already embodied and indoctrinated and not necessarily being aware of where the sources come from is what I find to be very interesting, and movement is a great way of being able to translate that. We’re shooting one of the ritual scenes inside of Judson Memorial Church and the stained-glass windows, are very ecclesiastical. You have this image of pious Christianity and there is this African styled movement that’s taking place. That’s not a radical thing, because, as I said, that takes place in so many Black churches across the country on a Sunday morning, but I’m able to emphasize that more through the costumes and movement in the piece. You asked about what surprised me. One of the things that really surprised me most of all, and I’m glad that I was able to make the connection in the film, is the fact that the African Burial Ground that’s in downtown Manhattan, is directly across the street from the two ICE offices that Ramesh and many other people have to check into. Along with Ramesh’s ethnicity, I wanted to make a correlation that people can interpret in so many different ways, and I hope that they do. The history of the African body is a part of the foundation of the economy here. Immigration policing and the African Burial Ground find themselves literally across the street from each other. JT: Before we started recording, you talked about this false notion of a separated sacred and profane that, to me, also comes to bear in your use of Africanized aesthetics. Could you talk about that? AD: I have studied African religions and African religions in the Americas at Union Theological Seminary and spent a month in Sénégal last summer studying religion. Our categories that we have are very Western, and the notion of the sacred having a certain time or having a certain place outside of the quotidian is something that is anathema to African traditional religions. I think it would be safe to say that would be the same for Native American spiritualities and religions as well. There is not a separate space specifically for only one.That’s not to say there aren’t sacred sites, (and at sacred sites, there are specific things you do), but just in general, growing up as a Christian in America, the church is the place that this is done here and there are things that are not done here. What’s great about being Community Minister of the Arts at Judson is that notion doesn’t exist here at all. Speculation takes place through the arts in the same space that bodies come together to meet, to congregate, to explore on a Sunday morning, or in the case of the Jewish congregation, on Saturdays. JT: What do you think is gained when we do away with the false notion of dividing the sacred from the secular? AD: I see it as a way for us to regain our humanity. Humans make art. That is a huge part of what distinguishes us as human. When speaking of the relationship of spirituality, mysticism, the soul, and religious practice, I feel that art is a way to speak to our emotions, to help us reorient ourselves to a world that we’re constantly discovering. I consider myself a speculative artist making use of art and philosophy as a tool for understanding who we are. Art creates alternative access; human beings in our adaptability must always strengthen our alternative conversations in the face of the singular global economic market of finance that we live in now. Religion, and the spirituality in religion is not the same as art or the spirituality in art, but they have worked with each other for thousands of years in the past. I find that my practice is very analogous to the religious “calling” as opposed to the “pursuit of a career” with a signature modernist style. I’m not so much concerned about that. I’m much more concerned with creating work that creates a practice through speculation that opens up how we can reorganize ourselves in a more human way. Joe Tolbert is the Director of Community Engagement for the Carpetbag Theatre, Inc, scholar, and Cultural Organizer. He received his B.S. in Communication from the University of Tennessee and is currently pursuing an M.Div. in social ethics from Union Theological Seminary in the City of New York. He is also a writer who has contributed articles to Alternate Roots, Quiet Lunch, among others. He started a podcast Art at the Intersections to archive the work of artists who work at the intersections of art, culture, and social justice in an effort to build the knowledge of the field. As a consultant, he is a sought after facilitator and cultural strategist that works with communities to help them harness the power of art and culture through the building, implementation and evaluation of cultural strategies.